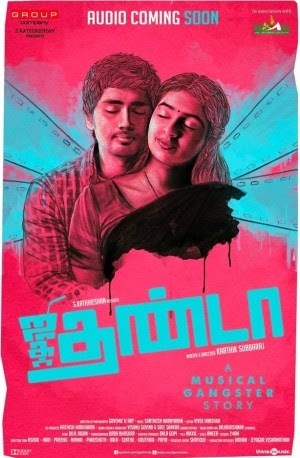 Jigarthanda is a totally unpredictable film. There is reality mixed in with creativity, terror with undercurrents of humour, sentiments, fleeting romance and loads of fun. Director Karthik Subbaraj’s brilliant script is complemented by excellent performances, compelling dialogues, perfect cinematography, and stimulating BGM. He has executed it perfectly too maintaining the fun and entertainment quotient throughout. Jigarthandais definitely a must watch. If Pizza was a con movie dressed up as a haunted house horror thriller, Jigarthanda is basically a comedy cloaked as a gangster movie. In the first half, the director provides us the gangster thriller that the trailers promised us. The tone gradually shifts in the second half and unlike Pizza, where a single reveal altered our view of the film, here, we never realize that we are seeing a film different from the one we had seen in the first half. More than anything else, it is Karthik Subburaj’s screenplay and direction which keeps this Jigarthanda taste good till the end. You are belted with thrills, comedy, drama and twists in what just might be the right proportions. Jigarthanda is one of those films made with a divergent notion. It is a story of passion and grit, coupled with betrayal and relationships. After long, a movie about making a movie will become a hit movie. After an intriguing first half where aspiration meets reality, the director weaves subplots one after another. A movie is never complete without little awesomeness squeezed between the main plots, and Jigarthanda has its share of it with lighter scenes between Siddharth and Karuna, the funny moments from Gangster’s sidekicks, a young lass who picks on Sarees and undoubtedly the end sequences.